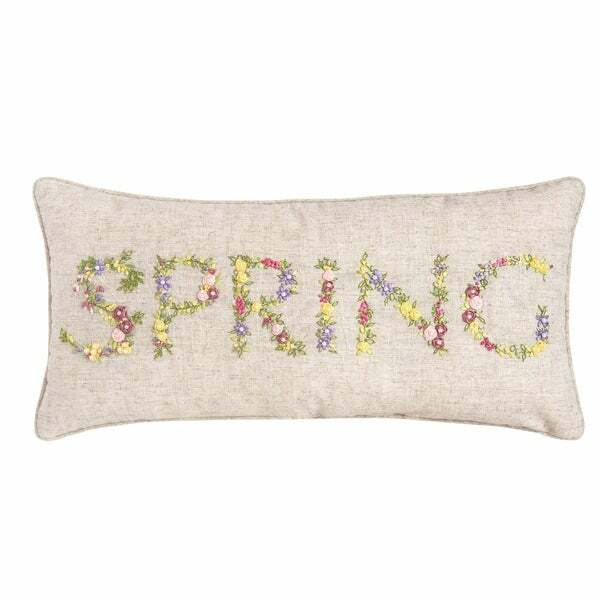 Spring Bunny Lumbar Pillow 12" x 20"
Spruce up your living space with fresh floral accents. Our collection of hand crafted ribbon art pillows feature various floral patterns and sayings perfect for warm days and cool nights. Each pillow is lovingly hand embroidered with a traditional satin ribbon design and embellishments. Choose from classic styles: joyful Zinnia Wreath, soothing Violets, a fresh Spring Wreath, beautiful Blue Birds, Wild Flowers and "Spring" each uniquely yours. Crafted with a soft polyester cover and lofty polyester filling this pillow brings a charming accent to your home. Spot cleaning recommended. Dimensions 16.0 In. X 16.0 In. X 4.0 In.